It’s safe to say that Stephen Hawking is one of the most influential and highly regarded theoretical physicists in history. Besides contributing to the fields of astronomy and cosmology, Hawking inspired multiple generations with a curiosity for space exploration and a love of physics. Stephen Hawking was born on January 8, 1942, in Oxford, Oxfordshire, England. He attended University College, Oxford, which is where his father went to college before him. Hawking wanted to study mathematics, which the school did not offer, and his father wanted him to study medicine, which Hawking wasn’t interested in. He finally settled on physics and earned a degree in natural sciences before moving on to the University of Cambridge, where he studied cosmology. Shortly after turning 21, in 1963, Hawking was diagnosed with amyotrophic lateral sclerosis (ALS), a disease that harms the nerves that control the muscles. Doctors told him he would live about two more years. They were wrong. Stephen Hawking circa 1980. Image by NASA and in the public domain, via Wikimedia Commons. In 1965, Hawking earned his PhD with a thesis titled “Properties of Expanding Universes”. He went on to hold numerous research fellowships and professorships, including that of the Lucasian Professor of Mathematics at the University of Cambridge, remaining in this position for 30 years. Hawking also wrote or coauthored 15 books. Most notably, A Brief History of Time: From the Big Bang to Black Holes was published in 1988 and has since sold more than 10 million copies. He received honorary degrees from 13 institutions and awards such as the Copley Medal in 2006, Presidential Medal of Freedom in 2009, and Special Breakthrough Prize in Fundamental Physics in 2013. In 2014, a major motion film called The Theory of Everything was released, detailing Hawking’s life story on the big screen. Stephen Hawking’s research connected two areas of physics that had been seen as separate entities up until that point — relativity and quantum mechanics — through the study of black holes. 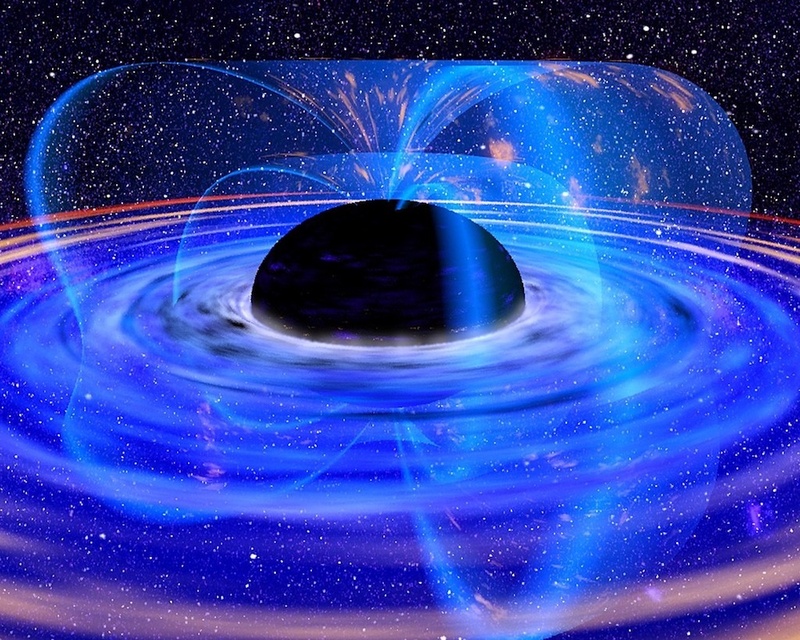 In the 1970s, black holes were regarded as totally inescapable gravity wells. Hawking provided theoretical proof that black holes actually release something as well: blackbody radiation, which is now known as Hawking radiation. The theory calls for the formation of a particle and antiparticle from totally empty space at the event horizon, or the point at which a particle can’t escape the gravity of a black hole. This concept of antiparticles and their ability to spontaneously form out of nothingness was a groundbreaking revelation in cosmology — and also showed how the fields of relativity and quantum mechanics could be compatible. An illustrated rendering of a black hole. Image by NASA and in the public domain, via Wikimedia Commons. Putting aside Stephen Hawking’s contributions to physics and cosmology, he was still an inspirational figure — even to people who hadn’t read a science textbook since high school. For example, in 2006, Hawking mentioned his interest in space travel during an interview. 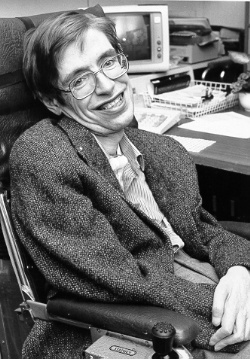 By this time, Hawking’s ALS made it so that he was in a wheelchair and spoke through a computerized voice synthesizer. His reasoning for a trip to space was two-fold: He wanted to raise interest in space exploration and show the world that people living with disabilities have limitless potential. 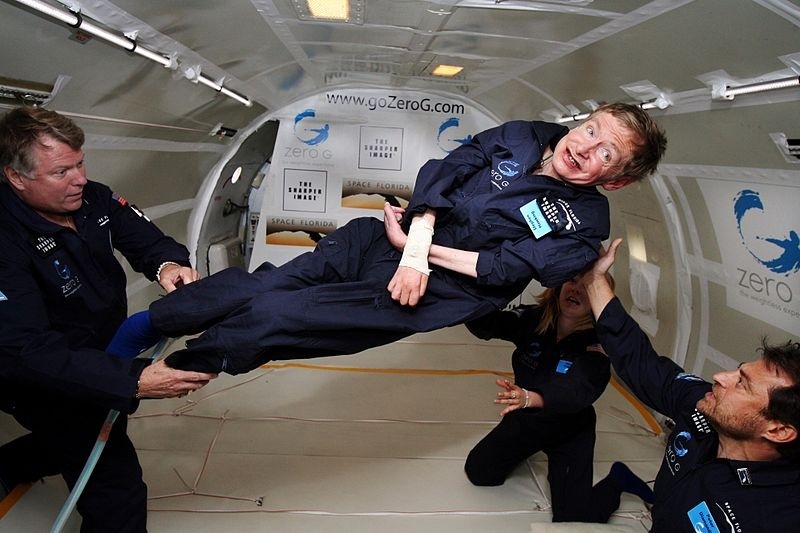 Stephen Hawking enjoys a flight in a modified, zero-gravity aircraft. Image by NASA and in the public domain, via Wikimedia Commons. Although Hawking never traveled to space in the conventional sense, he experienced a zero-gravity flight in a modified aircraft. In this way, Hawking got to feel what it’s like to float through space — while accomplishing his two missions at the same time. Hawking passed away on March 14, 2018 — more than 50 years later than when doctors predicted that ALS would take his life. His passing has since been mourned by scientists, students, and curious minds around the world. At a memorial service in June of 2018, words spoken by the late physicist were set to classical music and beamed into space toward the closest black hole, a binary star system called A0620-00. The gesture was meant as a symbol of Stephen Hawking’s indelible mark on Earth, curiosity in space, and exploration of the universe and everything within it that is waiting to be discovered.